Q&A: Why Are My Winter Tires So Loud? A: This is a very good question. You are right that snow tires or winter tires are noticeably louder than summer or all-seasons tires. There are a few key reasons for this. When it comes to most production parts for your vehicle, there are a number of compromises that are made along every step of production to make sure that the part meets its desired goal. In the case of tires, manufactures are making decisions based on ride quality, grip, handling, noise, longevity, puncture resistance, and many other factors. When they are designing a tire for the winter, they heavily weight the need for a strong grip on the road at low temperatures over most everything else. Tread Spacing: Wide spaces between the treads on winter tires give lots of grip and allow a path for snow and ice to be displaced as you drive. When the roads are clear, though, you can hear the sound of air being compressed inside the tread groove, especially at highway speeds. 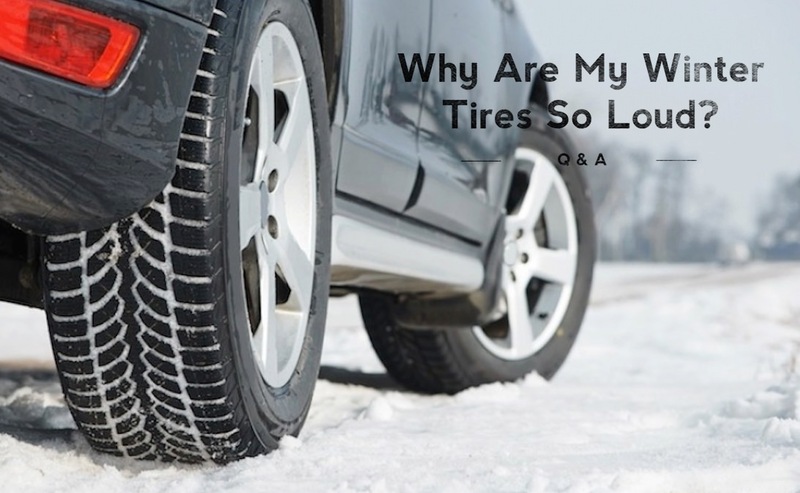 It tends to be much louder than summer tires and only the most expensive winter tires feature specially shaped grooves designed to prevent air compression from happening and scramble the sound waves from the compression when it does happen. Tread Blocks: Winter tires have a huskier look in part because of the tread design. Winter tire manufacturers have a range of tread designs, from asymmetrical and arrowhead to v-shaped and staggered shoulders. Each is meant to give you more traction by pushing away slush and snow so you can brake and corner safely. The increased traction, however, comes at the cost of increased road noise. Rubber Composition: Technically, winter tires are softer than summer tires, allowing them to remain pliable and sticky at freezing temperatures. Unlike a hard hockey puck that would slide over ice, your flexible winter tires bend and grip snow like the soles of a winter boot. They also contain silica, which is like sand, and gives the rubber a biting edge on slippery snow. The composition helps with winter driving conditions at the expense of road noise. Even though they can be loud and the ride can be a little more harsh than your summer tires, they are worth the tradeoffs. If you think your tires might be loud for another reason, just give us a shout, you may need to have them balanced or repaired, and we would be happy to help.